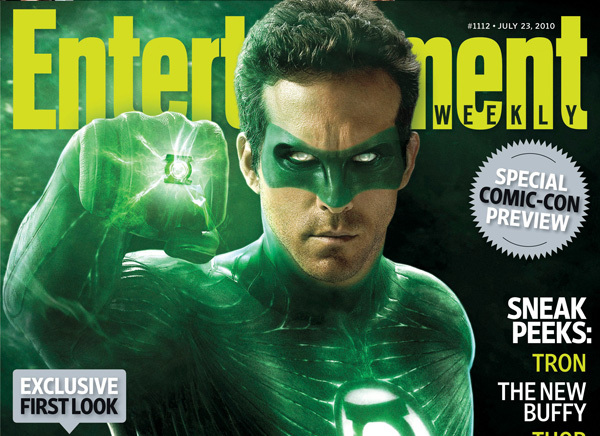 Turns out you don’t have to wait for Comic-Con to get your first look at Ryan Reynold dawning the Green Lantern suit. Entertainment Weekly has the exclusive “First Look” for their August issue, which will hit stores tomorrow. To be honest, I’m kind of “Meh” about the design of the suit. If it wasn’t for the ring, the symbol, and the mask, I would have no idea who this character was suppose to be. His mask looks painted on, the white-out contacts look weird, and the suit looks like a wet-suit with LEDs in it. I just can’t believe they spent more money to do the suit in CG for the entire movie, rather than just make an actual costume. Horrible costume aside, I still have some hope for this movie. I’m was really digging that they’re bringing Parallax into the story so early, hoping that if they turned it into a franchise, the films would lead to the inevitable Emerald Twilight arc. Whatever they got prepped to show at Comic-Con, better be good. 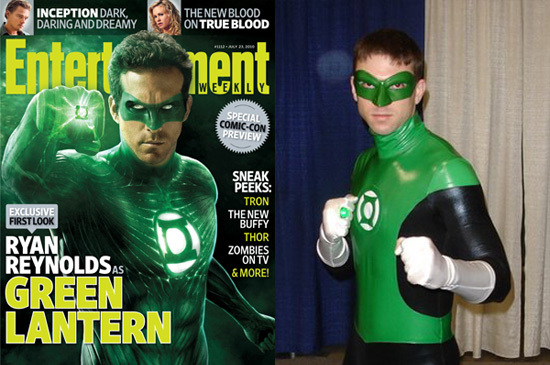 This Cosplayer looks more like the Green Lantern than Ryan Reynolds does.